The Port of East London is South Africa's only remaining river port and is situated at the mouth of the Buffalo River in the East Cape Province. The original name was Port Rex. At Longitude 27º 55' E and Latitude 33º 1' S the general cargo port has good rail and road connections with the hinterland (Free State and Gauteng) and north and southwest to KZN and Port Elizabeth respectively. The port boasts the largest export grain elevator in South Africa, which has recently been converted to handle imports in addition to exports. A car terminal on the West Bank, which includes a four-storey parking facility connected by dedicated road to the adjacent Daimler (Mercedes Benz) factory, has transformed the port. The terminal has a theoretical design throughput of 50,000 units a year with 2,800 parking bays. The parkade has been designed to be increased in size to 8 storeys to raise the throughput to 180,000 vehicles a year. Provision of a third berth is also a possibility. The multi purpose terminal on the East Bank handles an increasing volume of containers and is geared for 90,000 TEUs a year - many for the motor industry. Ships own gear is required as the port lacks gantry cranes. 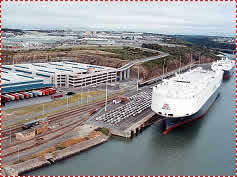 East London has a dry dock capable of handling ships of up to 200m and a maximum beam of 24.8m. The dock is equipped with four electric and one mobile crane. There are a total of 12 commercial berths plus a repair quay of 110m, a pilot jetty and fishing jetty next to the small Latimer's Landing Waterfront. Six of the berths lie on the West Bank. The port has a total of 2,410m of quayside. The port entrance is dredged up to 12m, the draught at the berths vary from -8.5m to -10.4m alongside. Passenger ships are accommodated at whichever berth is most suitable and available. The entrance to the Port of East London is dredged for ships with a maximum draught of 10m on all tides or by prior arrangement with the harbour master. The port can accommodate vessels of up to 245m. Draught at the various berths range between 8.5m and 10.4m (grain and oil berths). The outer anchorage is approximately 1 n.mile east of the southern breakwater but the position is exposed. Pilotage into port is compulsory from a boarding point 2 n.miles northeast of the north breakwater, serviced by pilot boat. Tug assistance is compulsory within the port. The port is serviced with a fleet of three tugs - two 1978-built 43ton bollard pull Z-Peller tugs Mpunzi (ex Dirk Coetzee) and Umtwalume (ex Coenie de Villiers), a 1980-built 43 ton bollard pull Voith Schneider tug named Chardonnay (ex WH Andrag) and a workboat/tug of the Tern class named Tristan Tern, which has a 19t bollard pull and which entered service in July 1998, plus a harbour launch. Pilotage and tug assistance is compulsory. Dredging of the port and approaches is performed by the Piper or Crane sent from Durban as required. Marine services are available between the hours of 06:00 and 22:00. The NSRI maintains a station base at the port and has a rescue craft named ACSA Rescue One available for emergencies at sea. East London handled a total of 333 ships during the fiscal year 2008/09, with a gross tonnage of 8,821,900. Cargo handled in 2005 amounted to 2,682,832 tonnes, including containers. Bulk cargo totalled 1,295,934t and breakbulk cargo 638,822t. Containers by weight amounted to 748,076t. Imports amounted to 1,175,410t and exports were 758,000t, with 1,346t recorded as transhipped. The port handled 55,413 TEUs during 2008/09, of which 28,684 were imports and 26,729 exports. The majority of containers were for the local motor industry. The car terminal, opened in September 2000, has an annual capacity of 50,000 vehicles a year at present and is highly mechanised and computerised, being staffed by a total of 12 people. The grain elevator has a storage capacity in its silos of 76,000 tonnes and has been converted for imports. Like other ports of South Africa, East London is a common user port, meaning that it usually operates on a first-come-first-served basis. The port consists of a Multi-Purpose Terminal (including the container terminal) on the East Bank, and a Bulk Terminal (Grain Elevator) and Car Terminal both on the West Bank. The Grain Elevator, with a storage capacity of 76,000 tonnes is the largest in South Africa. In the 1970s the elevator handled 3.8 million tonnes of exports and in 1994 a total of 2.1mt, during a time when the Durban facility was out of commission. Recently the elevator was converted to handle discharged cargo (imports) and in recent years has handled World Food Aid imports on behalf of the United Nations. Nowadays the Multi Purpose Terminal handles mainly containers - 55,413 TEUs during 2008 using ships own gear as the port lacks gantry or mobile cranes or other sophisticated container-handling equipment. The Car Terminal on the West Bank has been responsible for a turnabout in the port's fortunes and is geared to handle 50,000 units annually, which it has already exceeded, and has space for expansion when required. Bunkering with fuel oil and marine gas oil is available at the port from pipelines at S and T berths on the West Bank of the harbour. Cruise ships use any available berth, usually on the East Bank. Ship repair facilities are extensive with a well equipped dry dock able to handle ships up to 200m length. The outer anchorage one n.mile east of the south breakwater offers anchorage for vessels outside the port, but lies in an exposed position. A full range of ships chandling and stevedoring is available. The port houses a yachting marina within the harbour at Latimer's Landing where there is a small waterfront and the NSRI maintains a rescue vessel named ACSA Rescuer One plus an inflatable named Spirit of Madiba.